Buy South Indian Bridal Jewellery Set made of copper with high gold polish. Pakage consists of Long, Medium & Short Necklace, Earrings, pair of Bajuband, Kamar patta, nine piece hair accessory and maang tika. We are renowned companies of market for providing the premium quality collection of Long Chainimi, which is enormously employed in the market. 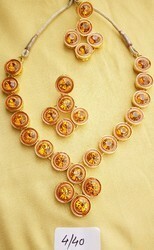 We offer an exquisite range of Necklace which is available in different colors as per clients specifications. Our range of product is intricately designed using precious and semi precious stones and is available in the market at competitive prices.